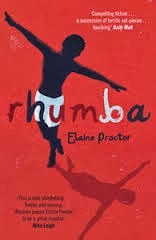 Rhumba South African film director and screenwriter, Elaine Proctor’s, first novel was published in 2012. This is another novel that I really wanted to read when it first came out, but never got a chance to until recently. This is also another review coming in much later than I anticipated. Thank you also to Quercus for the review copy. Set in an immigrant Congolese community in North London, Rhumba is the story of Flambeau – a ten year old boy who was smuggled out of Congo to live with his mother’s family in London for a better life. Flambeau’s mother, Bijou, was meant to come soon after him, but she never showed up. While waiting, Flambeau experiences abuse at the hands of his uncle. He eventually decides to go look for her and feels the sapeur he meets called Knight, might be able to help. He also meets Eleanor, Knight's Scottish girlfriend. With time, Flambeau and Eleanor develop a bond. I seem to be reading a lot of 'not-so-happy' stories lately. Here's a little boy who has been smuggled into London, is abused, is homesick and misses his mum. Yet, through Flambeau’s youth and innocence Elaine Proctor manages to write a story about hope.So while this could have been a depressing immigrant story, from Flambeu's eyes it makes you realise that there is hope even in the darkest circumstances. Another thing I loved was how through her writing I could ‘see’ what I was reading - the rooftop where Flambeau hunts down pigeons, his conversations with Eleanor. Most of all, while reading it I felt that there really was rhumba playing in the background. Honestly, I probably should have listened to some Rhumba while I was reading it. Elaine Proctor even selects some of her favourite Congolese rhumba music and artists mentioned in the book. Overall, I did enjoy this book, with equal parts of pain and hope.